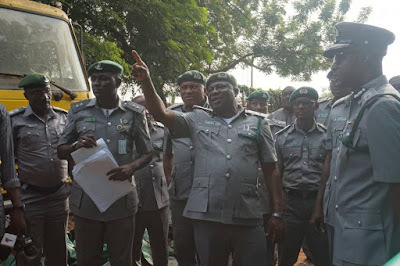 The Nigeria Customs Service has again warned smugglers to desist from carrying out their nefarious activities in and around Ogun state. The Ogun Area Controller of the Service, Michael Agbara, handed down the warning at Idiroko shortly after conducting the Assistant Controller General in charge of Zone ‘A’ Aminu Dahiru, round some of the creeks in the state. Agbara insisted that the command will not rest on its hoarse towards ridding the state of smugglers. He reiterated that his officers and men would continue to seize foreign rice at any part of the state. The Area Controller also told newsmen that the command would continue to prosecute all arrested suspected smugglers in the state. According to him, “like I will always say, we are not going to relent. Even if they attack us, thinking that we will be intimidated, we will not be intimidated. I have told all the smugglers to relocate or we will deal decisively with all of them. “We will continue to warn them to leave smuggling of rice and be at peace. But as long as they don’t want to be compliant, we will follow them, whether to the creeks or to their warehouses. Anywhere we see foreign rice within the territory of Ogun Command, we shall go for it. So there is no safe haven in Ogun. “I want to tell all of them pomp and clear, we are not mincing words, don’t patronize Ogun because we will arrest you. We will apprehend you and deal with you according to the law. This is a warning to all smugglers. He commended the dedication of his men and solicited for increased support from the top echelon of the service. “We are not doing any magic. It is just the commitment of the officers. The officers are ready to go and the management has given us the backing and we cannot afford to fail. “I want to commend sister security agencies who have been very supportive of all our efforts. They have been collaborating with us”. Agbara also stated that the visit of the ACG would spur his officers to be more committed to their duties. “The ACG is in charge of the southwest, what we call Zone A. It is just like your father coming to your house, you know that you will have the morale booster. “He has come to see our problems, he as listened to us and he has given a sound advice on some of the issues and he has promised to take some of our challenges to the management to find solutions. “He has been to the creeks to the see the magnitude of the problems that we have been complaining about. If he doesn’t come, he may not know what we are facing. He has come to see it and he has equally proffered his own solutions and advice. “So it is like it will galvanize us to do more”.